Accidents involving large commercial trucks occur for many reasons, including driver negligence, truck defects, improper loading, and more. One very common act of driver negligence is driving while fatigued. Fatigued driving can cause a truck driver to lose concentration or even fall asleep behind the wheel and the resulting accidents can be devastating. In fact, studies show that fatigued driving is just as dangerous as driving while drunk. The truck accident attorneys at the law firm of Flaherty Fardo are dedicated to helping accident victims recover from fatigued or otherwise negligent drivers. The Federal Motor Carrier Safety Administration (FMCSA) reports that fatigue plays a role in 35-40 percent of all truck accidents. In order to try to prevent fatigued driving accidents, the FMCSA enacted stricter regulations regarding how long a commercial truck driver may work and when he must rest. These rules are called Hours of Service (HOS) regulations. Take 34 hours of rest following a 70-hour week, including at minimum two nights between 1:00 and 5:00 a.m. These are only a few examples of HOS rules intended to prevent fatigued driving. In spite of the safety risks, many drivers continue to violate FMCSA Hours of Service rules and drive while physically and/or mentally exhausted. Many drivers want to make more deliveries within a certain period of time in order to collect more money. Therefore, they drive as much as possible, often for entire 24-hour periods. Some truck companies encourage, or even require, drivers to continue to drive through breaks or for longer periods of time than legally allowed. Truck drivers often falsify log books and other records to make it look like they are in compliance. Truck drivers must be alert because they are driving huge vehicles that may weigh up to 80,000 pounds, often at high speeds. When a truck driver nods off or loses control, a commercial truck can cause severe injuries to any motorists in its path. An experienced Pittsburgh truck accident lawyer knows how to identify fatigued driving and present evidence that the truck driver was violating regulations or simply negligent in driving while too tired. If your attorney shows this, you will likely receive substantial compensation from the responsible driver and/or trucking company. Truck drivers have a duty to comply with all FMCSA regulations and to drive in a manner that will keep other motorists reasonably safe. When drivers fail to do so and choose to drive while fatigued, they should be held accountable for all damage and injury they cause as a result. 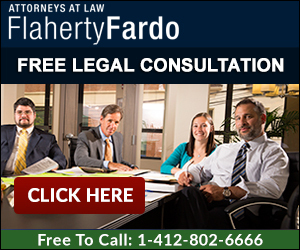 If you have suffered injury due to a fatigued truck driver, do not hesitate to contact the personal injury attorneys at Flaherty Fardo at (412) 802-6666 for help. We have extensive experience with complicated truck accident cases and can help you receive the compensation you deserve.